We are again awarding two Olympic Bursaries this year so this seems a good time to review how last years awards went. Following the successful 2012 Olympic Games it was agreed that both Rotary Clubs in Sherborne would give £500 per annum for 4 years, until the Rio Olympics, to assist two talented young people each year, with their sport ambitions. Alan Cummings, Joint Head of Physical Education at the Gryphon School has worked with us on this project to promote it within the school. Interested pupils were asked to apply giving details of their current level of performance, highest achievement in their sport, ambitions over the next five years and finally how the award would assist them in achieving success in their chosen sport. Only pupils with County and/or national level participation were asked to apply. Nick Durkin from the Rotary Club of Sherborne, and Sue Thomas-Peter from our club selected a short list of four boys and four girls with a list of sports including Pentathlon, Dance, Badminton, Shooting, Kayak Sprint Racing, Sailing and Motorcycle Racing. The interviews were held in January 2013 with each applicant having 5 minutes to make their presentations in which many had included power point presentations, video, testimonials, cups and medals. The children were absolutely fabulous, confident and clear in their ambitions and it was very difficult to make a decision. 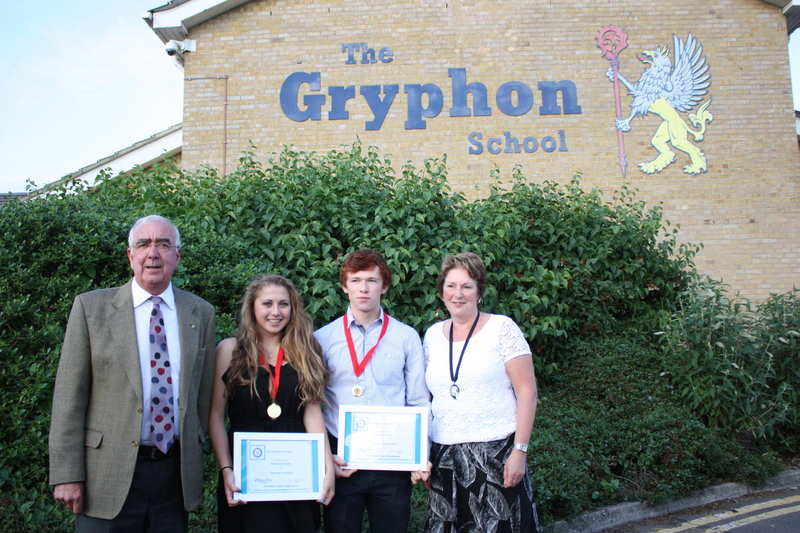 The Winners Pentathlete Rebecca Bowles and Sailor Ross McFarland with Sue Thomas-Peter and Nick Durkin. During 2013 Rebecca’s hard work earned her 3rd place in the National Tetrathlon and this has resulted in her being placed on the World Class Talent Pathway programme. We believe she is one of just five in Great Britain in her age group, who has been placed on the programme.